It's easy to forget that there was once a time when Michael Jordan wasn't considered the greatest basketball player ever. But Jack McCallum remembers that time, and describes it (and how Jordan changed things) here, in an excerpt from his new book Dream Team, which we wrote about two weeks ago. The book is out today. Go buy it. There was a segment of the basketball population that didn't completely buy into Michael Jordan when he was at North Carolina, where, as common logic had it, the only one who could stop him was Dean Smith, a rigid fundamentalist whose teams often held the ball. Anyone with one working eye and a semifunctional cortex knew that Jordan was going to be spectacular in the pros, but one supposition was that he would be a Clyde Drexler type, referencing the University of Houston product who had just finished his first season with the Portland Trail Blazers—that is, flashy but sometimes out of control, a scorer but not a shooter, a fan favorite but not a coach's choice. Though that impression would endure in some quarters until 1991, the year Jordan won his first championship with the Chicago Bulls, the basketball cognoscenti watching the L.A. Games saw what it really had in Jordan. He was a player who could break a zone with a jumper, lock down a high-scoring opponent, run the offense from the point if he had to. He could please Bobby Knight, for God's sake. "The 1984 Olympics," says David Falk, his agent, "was Michael's coming-out party." Behind Jordan, the United States tore through the Olympic competition, winning its eight games by an average of 30 points and in the process drawing comparisons to the great Oscar Robertson–Jerry West team of 1960 that won gold in Rome. The United States beat Canada 78–59 in the semifinals and destroyed Spain 96–65 in the gold medal game, and the name Michael was on the lips of basketball fans everywhere. It had become evident that Jordan was the Chosen One, and no one knew that better than Falk, who had already commenced endorsement negotiations with Nike that would forever change the way athletes are marketed. Jordan had always worn Converse, the sneaker of choice for both his college coach and the United States Olympic Committee, and the de facto historical choice of most hoopsters. Michael has since said that he, like many players, believed that Adidas made the best product. Had he gotten a decent offer, Jordan probably would've signed with either Converse or Adidas. But Falk saw Nike as hungrier and more market-savvy than either of them. Both Magic Johnson and Larry Bird, the two biggest names in the pro game, wore Converse, but the company, coasting on its past rep, did almost nothing with them. Think about it: Magic had an immortal nickname, a thousand-kilowatt smile, a flashy game, a glitzy home base, and a championship resumé, yet in the early years of his career Converse didn't come close to capitalizing on his appeal, a decision that cost both Magic and the company millions. "Way before Michael came into the league," says Falk, "Magic could've owned the world." At Nike, by contrast, executives such as Rob Strasser saw in Jordan a new horizon for the endorsement game. Plus, Nike needed to make a major move since the running boom of the 1970s had petered out. It was a company that prided itself on taking chances, so it had decided to blow its entire marketing budget, $500,000, on advertising that would feature Jordan, plus what it would have to pay him to wear the sneakers. Still, Jordan was resistant to Nike, which he had never worn and knew very little about. The night before he, his father, and Falk were to fly to Nike headquarters in Beaverton, Oregon, Jordan told his mom that he wasn't going. But she wouldn't hear of it. "You will be on that plane, Michael," said Deloris Jordan. So he was on the plane. At that first meeting, Peter Moore, Nike's head designer, showed Jordan and Falk the sketches he had made of Air Jordan shoes, warm-up suits, and apparel, all of it in black and red—"devil's colors," as Jordan told Falk. Jordan never blinked, never smiled, never said much of anything, and everybody in the room figured that he was underwhelmed. But after the meeting he admitted that he was swayed, and Falk negotiated a five-year $2.5 million deal that, like so many deals over the years, was supposed to bring the world to an end. 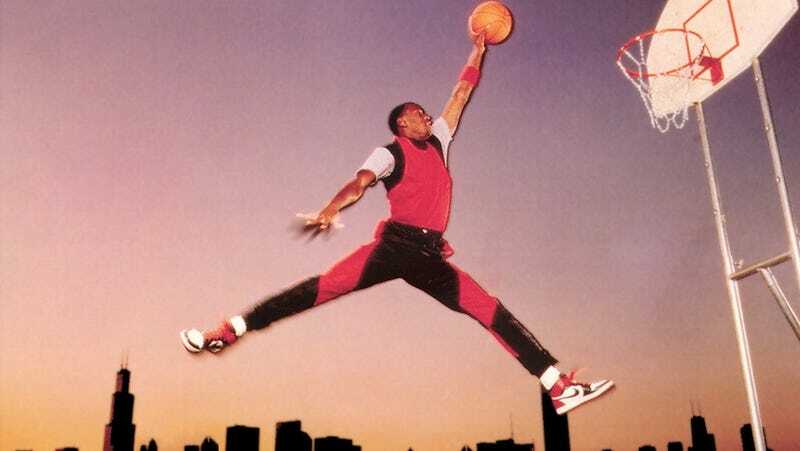 So was born Air Jordan. At first Jordan hated the red-and-black shoe. "I'll look like a clown," he said. But he relented and wore them, after which the NBA ruled them illegal for some bizarre reason, fining Jordan $5,000 per game, a sum that Nike paid with a secret smile. A design compromise was eventually reached, and the major thing the fines had accomplished was to turn Jordan's shoes into one of the biggest stories of the 1984–85 season and gather worldwide attention for Nike. Rod Thorn, the Bulls' general manager at the time, asked Falk, "What are you trying to do? Turn him into a tennis player?" "Now you get it," said the agent. From the book Dream Team by Jack McCallum. Copyright © 2012 by Jack McCallum. Reprinted by arrangement with Ballantine Books, an imprint of The Random House Publishing Group, a division of Random House, Inc. All rights reserved.